Probably my best Jupiter of the season so far, a 6 hour strip map showing over half of the surface of the planet which I drew back on the night of 05-06 December 2012. I made the drawing with my 8 inch Newtonian Reflector here in Leicester, UK. I make the original drawings at the telescope in black and white and then use water colour pencils to make a colour version indoors. 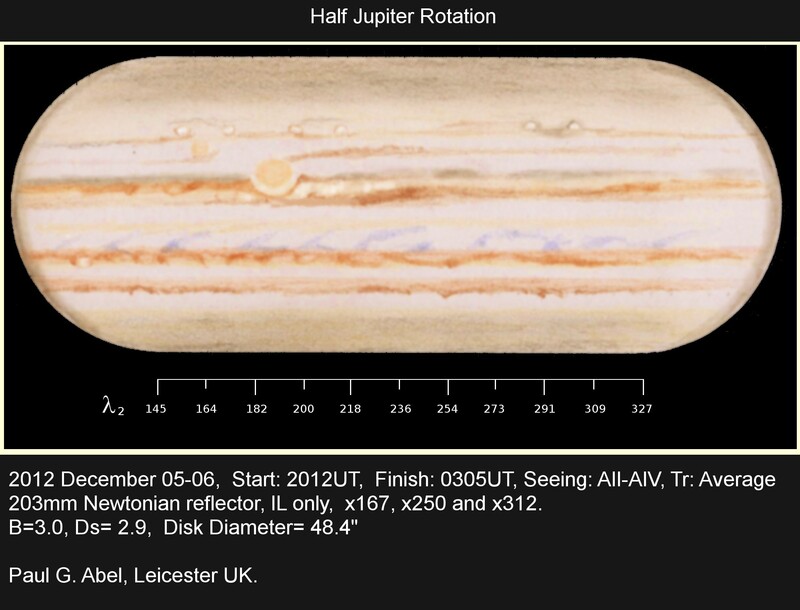 This is an excellent drawing and reminds me of one night when I was watching Jupiter rotate for hours under exceptional conditions with my 7″ f/15 Maksutov. Your drawing records more detail than I can remember from that night years ago, but there is that characteristic solidity of features and the colors that this kind of aperture brings out. An excellent observation and an excellently executed drawing.